Our service provides door-to-door pickup of food scraps. 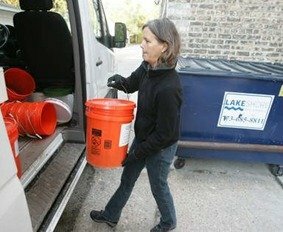 We provide a 5-gallon bucket to your family and then weekly or biweekly pick up the food scraps and take them to a commercial compost site. We leave a clean bucket for you to continue your collection for the next pickup. Most households work with some kind of countertop container and then empty into the big bucket when needed. Some customers choose to keep the bucket outside with a brick or flower pot on top, or it can be put out on pickup day. Commercial composting is different than yard composting. At a commercial site, you can compost anything that was once alive, including animal products and food-soiled paper. Click here for a complete list. The size of your family helps determine the frequency of your pickup schedule. A family of four generally gets a weekly pickup, while a single person may only need a pickup every four weeks. Weekly pickup is $10.50, biweekly is $15.50 and every four weeks is $20.50. We ask for payment with each pickup, or you may pay in advance for as many pickups as works for you. We offer a 10% discount for one annual payment. All we need to get you started is your home address, a daytime telephone number, and if you want weekly, biweekly or four-week service. We’re adding more towns and neighborhoods to our pickup area. Let us know if you’re interested in seeing us crop up where you live. 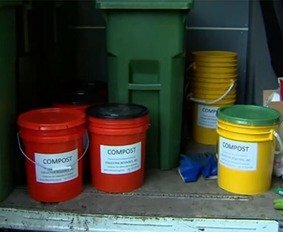 ​"Between this (composting) and recycling, we're not quite at zero waste, but we're closer than we frankly imagined that we could be at this point in our lives - and we're really excited to be able to say that!"